We note that, in very truth, none have come before the Lord. For he is before all things and all things have come into being through him. Surely, no man has come into the world who did not proceed from the creative force of the Divine Word, for all things came to be through him and, without him came to be nothing which came to be. If, then, none can have come before the Word who was in the beginning; why does Jesus tell us all others, as many as have come, are thieves and robbers? Have any at all come before the Word? No! But some came before the Incarnation. Are all of these thieves and robbers? Must we maintain that the previous dispensation was not of God but of the devil? This would be the error of Marcion. No, the Law was given by God. And Moses and the prophets spoke of Christ. And, alghough they came before, they are not thieves and robbers; for they did not come before the Word of God but proceeded from him. No man has preceded the Lord, but from him all things proceed. There was a man sent from God, whose name was John. The words of Scripture give us the first hint of an explanation to our question. John is the Elijah who is come, he is the forerunner of the Lord – the angel who prepares the path of the Christ. John came before Jesus, but he said in truth, he that shall come after me, is preferred before me: because he was before me. 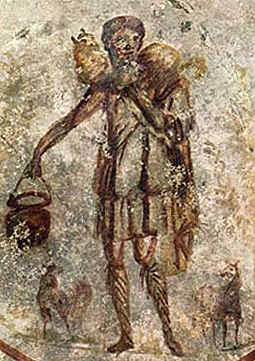 St. John the Baptist is not among those who came before although he did come before. Christ is not after John although he did come after. And although John truly came for a testimony and pointed to the Lord and said, Behold the Lamb of God; Christ Jesus can truly say, I receive not testimony from man. Indeed, the Lord gave testimony to John when he said, He is more than a prophet – it was Jesus who confirmed John, not John who confirmed Jesus; for Jesus came before John. Consider Moses, Elijah, and the others who came before and bore witness to the Truth. Although Moses and the prophets speak of Christ and give testimony to Christ, it is more truly Christ who confirms the Law and it is the Lord Jesus who witnesses to the Prophets. In fulfilling all that had been written in the Law and the Prophets, the good Jesus does not fulfill that which preceded him. No, rather Christ fulfills that which proceeded from him – for no man has prophesied except that he be moved by the Word of God. In this way, the reproaches of our Shepherd do not fall on Moses or the prophets, nor on John the Baptist; for they proclaimed the future Messiah and prepared the way for his coming. Indeed, Abraham rejoiced to see the day of our Lord. All others, as many as have come, are thieves and robbers. Here the Douay-Rheims translation gives us an insight which is perhaps missing from the Lectionary. The Greek text may be rendered (most literally) all, whosoever who have come, are thieves and robbers (and this is relatively close to the Lectionary translation); but the real sense of the passage is all others, that is, all those other than Christ. Whosoever has come or will come or is come, excepting Christ, is a thief and a robber. It is not merely that the Lord Jesus is a good Shepherd; rather, he is the good Shepherd. Moreover his not merely one shepherd among many, he is the only shepherd. Everyone other than Christ is a robber and a thief. Nevertheless, we must realize that, though there are many priests of the New Covenant, there is only one Priest. In the many ministers, there is yet only one Priest, who is Christ the Lord. Sacramentally, really, and truly, there is only one Priest – for the sacramental character given through the sacrament of holy order is a configuration in Christ. For this reason, St. Augustine can say that, whosoever baptizes or confers any of the sacraments, it is always Christ who is the minister of the sacrament (through the earthly sacramental minister). The Spirit testified to this when he said to John, This [i.e. Jesus] is the one who baptizes. Does Peter baptize? It is Christ who baptizes. Does Paul baptize? It is Christ who baptizes. And, if even Judas baptized; it is Christ always who baptizes. Thus, the thief and the robber is the one who comes not in the power and Name of Christ Jesus, but in his own power and in his own name. Such were the Pharisees, who spoke only with their own authority and not with the authority of God. This may be too controversial question to answer, but who are the present day thieves and robbers? Bl. John Paul II, in his letter to priests of 9 April 1979, indicates that unfaithful priests are the hirelings to whom the sheep do not belong. Some of the Church Fathers say that those priests who do not preach Christ, but seek their own gain and do not reprove the sinner; these are the thieves and robbers. It would seem also that those from outside the Church who seek to destroy the flock through worldly enticements and through ridiculing the Church and her teaching, these are also thieves and robbers. I would not want to name names (it would seem to me that this would be a sin of detraction) ... I would say that, generally, there is a constant struggle for most all priests -- there are always temptations to seek one's own glory or preach a gospel other than that which Christ gave us ... this is why we need to pray constantly for our priests and (especially) for our bishops; that they may remain true to the tradition of faith and that they might protect flock from the wolves of the present world. Father, I never meant for you to name names - that would be the last thing I would want - I was just asking in a general sense and should have indicated that in my post. Thank you for your answer. All priests in general have my prayers and sacrifices each and every day. Many I pray for by name (I have added you to my list, Father, and hope you do not mind!). God reward you for this forum! Actually, in scripture, the theives and robbers were 'lestai', a revolutionary or bandit - today we might say 'terrorist'. These 'messiahs' wanted to lead Israel in armed rebellion against Rome, and Jesus offered them a radical alternative. (See Simon Perry's novel All Who Came Before). Interesting interpretation ... I don't think it is too rooted in Scripture, though. The Greek is not simply "lestai" (robbers), but also "kleptai" (thieves) ... very little reason to think that Jesus is speaking of revolutionary terrorists ... in fact, the whole notion of the parable is that these thieves and robbers are stealing the sheep and leading them astray -- we are speaking on a different level than political messiahs. Certainly, the revolutionary zealots would be one example of the false-shepherds; but that is not the only application (or even, necessarily, the primary application) of the parable. The vulgate gives "fures" and "latrones" ... the Fathers of the Church think of them as thieves and robbers too (i.e. I don't know of any reference to terrorism among the Patristic commentaries). Whatever the novel says, it is only a novel ... I trust the tradition over modern so-called insights (no matter how clever they may seem).